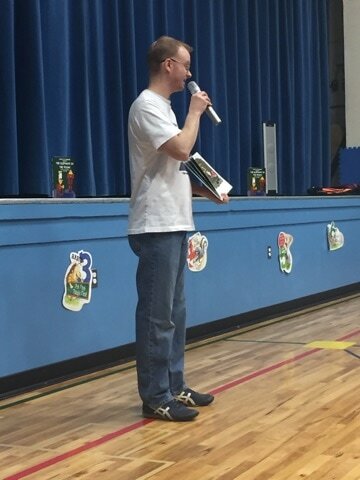 Since becoming a published Author, visiting schools and talking to kids has quickly become one of my favorite things to do! Interacting with kids and sharing my story with them and hopefully inspiring them to do what they love is an amazing feeling! ​And YES, I would absolutely LOVE to come visit your school! ​Please feel free to e-mail me at: kartunist78@yahoo.com or fill out my online CONTACT FORM to inquire today! My books are children's books and are aimed at younger kids (Kindergarten - 2nd/3rd grade). However, the subject matter is all about English idioms and how confusing they can be, which is something that older kids (4th, 5th, 6th) learn about. So my audience is actually pretty large and I do have 2 different presentations that I typically do. For the kindergarteners through 4th graders: I introduce them to idioms and share a few easy examples with them and I talk a little bit about the writing process. Then I share my 2 current books with them and I talk about following their dreams, since this has been a dream of mine since I was a child. Then I end my visits by teaching them how to draw my main character, Beamer. This presentation typically takes approximately 30-45 minutes. For the 5th, 6th, 7th, 8th graders and up, I share my story about how I became a published author and I talk about the different ways of getting published and about marketing and selling, all the while sprinkling English idioms throughout the story and quizzing them on their meanings. I also talk to them about following their dreams and I also end by teaching them how to draw my character, Beamer. This presentation typically takes approximately 30-45 minutes. I also hand out a flyer, a coloring page and a Beamer sticker or bookmark to each of the kids during all of my visits. I have done small single classroom visits, groups of 2 or more classrooms combined, full assemblies, etc. So I'm pretty flexible and will do whatever works best for you and your students. As far as pricing goes, I typically charge $450.00 for a school visit. And depending on how far away the school visit is, additional travel charges may apply. ​And again, please feel free to e-mail me at: kartunist78@yahoo.com or fill out my online CONTACT FORM to inquire today!